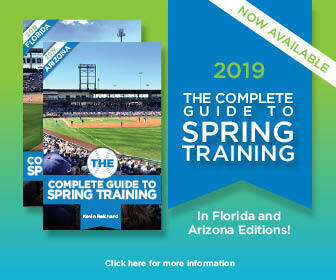 We’ve posted the Texas Rangers 2019 spring schedule, as the team preps for another training camp at Surprise Stadium in Surprise, Arizona. The Rangers are scheduled to play 35 spring training games in 2019, including 33 Cactus League contests.The schedule includes a pair of exhibition games with the Cleveland Indians at Globe Life Park in Arlington to close the spring schedule on Monday, March 25 and Tuesday, March 26. It will mark the fifth straight season that the club has hosted exhibition games versus a major league team in Arlington to close the spring training slate. Times and ticket information will be announced at a later date for those games. Texas’ 33-game Arizona schedule features 18 contests at Surprise Stadium/Billy Parker Field. The Rangers will be the home team for 16 of those games and will be the visiting club for two contests against the Royals, who share the Surprise complex with Texas. Those two teams will play four times overall in Surprise in 2019, the Cactus League opener on Saturday, February 23 (Royals home game); the Surprise Sundancers Charity Game on Monday, March 11 (Rangers home game); Thursday, March 14 (Royals home game); and Sunday, March 24 (Rangers home game). Online tickets sales open Saturday, October 20 for season tickets, mini plans, and specialty ticket packages and will be available for purchase at SurpriseSpringTraining.com. Online sales for individual game tickets begin Saturday, November 17 and will be available at texasrangers.com. The Surprise Stadium Box Office will open for walk-up sales beginning Saturday, January 5.